00:55 Allegramente The first movement opens with a single whip-crack, and what follows can be described as a blend of the Basque and Spanish sounds of Ravel’s youth and the newer jazz styles he had become so fond of. Like many other concerti, the opening movement is written in the standard sonata-allegro form, but with considerably more emphasis placed on the exposition. At 106 bars in length, the large exposition section contains most of the musical ideas presented in the first movement. 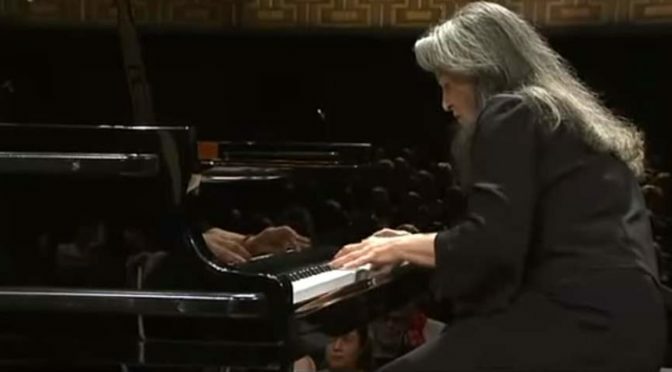 After the opening whip-crack and snare drum roll, the piano is introduced, providing a methodical accompanying figure as the winds present the first subject. Soon, the piano stops and the orchestra roars to life with each section adding to the theme, eventually drifting into an eerie, dream-like statement from the piano. This soliloquy is short-lived as the orchestra reenters with a blues-influenced figure, shifting between major and minor modes. The second subject begins with an awkward dissonance (A♯ and B), but quickly establishes itself as a richly melodic section, reminiscent of Gershwin’s Rhapsody in Blue.Following a quick chordal passage from the piano, the development begins, utilizing much of the material from the first subject. After progressing through a variety of modes, the music comes to a mystic section played by the harps and strings. Following a short rest, the section continues, but is quickly interrupted by a restatement of the “blues section” from the first subject. An abridged version of the first subject begins the recapitulation, after which a piano cadenza restates the second theme. Through this elaborate restatement, the movement progresses to an energetic coda and ends with a bawdy scale from the brass. 09:30 Adagio assai In stark contrast to the preceding movement, the second movement is a tranquil subject of Mozartian serenity written in ternary form. When Long praised the natural flow of the lengthy, seemingly effortless opening melody, Ravel responded: “That flowing phrase! How I worked over it bar by bar! It nearly killed me!”The first theme is presented solely by the piano, the right hand playing the melody in triple meter (3/4) while the left hand gives a waltz accompaniment (this left-hand waltz accompaniment continues throughout the second movement). After nearly three minutes, a C♯ by solo flute breaks the spell, whereupon oboe, clarinet and flute carry the melody into the second theme.This second theme is tenser than the first, utilizing dissonant harmonies and figures from the piano. Almost as easily as the theme appears, it fades away into a restatement of the first theme, this time played by the cor anglais while accompanied by rustling ornamentations of the piano. A brief coda brings the movement to a gentle close on a pianissimo trill between B and C♯. 19:32 Presto The piano introduces the first subject, a rapid chordal figure, with dissonant interjections from the winds and brass. The subject continues with such interjections from all, and progresses through a multitude of modes before finally coming to its conclusion. Here, the movement ends with the same four chords with which it began.Possibly due to its short length, the third movement is often repeated by the orchestra and soloist as an “encore” after the concerto.